If you're reading this its most likely because you're nosey (just like me!) 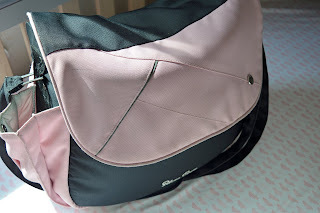 and you'd like to find out what I carry round with me in my 'narnia' of changing bags! 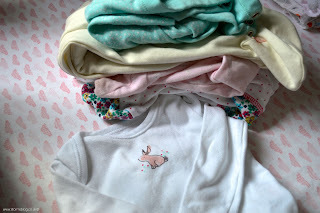 Despite the fact I am writing this as Maci is nearly 4 months old (how has that happened?!) 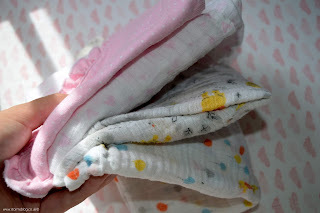 the contents of my bag has not changed drastically since she was born, only the sizing of the clothes have changed. The bag has many different compartments inside meaning it is easy to organise your belongings into categories and you also have four bottle compartments, two on the outside of the bag and two on the interior. 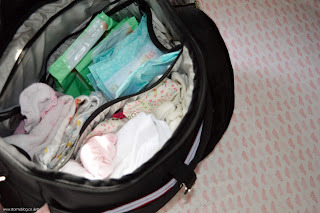 As you can see my bag is fairly organised (doesn't always look like this!) I organise it by putting clothes in the big pocket at the front, nappies, wipes and milk powder in the middle big section then muslin clothes and bibs in one of the pockets in the back and then I use the other section for Calpol, emergency sterilising tablets and other bits. The nappies I am currently using are the 'Lupilu' lidl branded nappies - Personally I have found many other well known brands aren't as absorbent as these and these are wonderful and barely ever leak! I always have a few muslin cloths and bibs in the changing bag because we have many 'puking incidents' during the day whilst we're out and if we have muslin cloths usually it means we haven't got to have a new change of clothes. I remember when I first took Maci out of the house I packed so many spare clothes and lets be honest, its hard to know what to take. 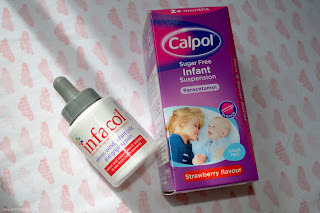 Since Maci is teething at the moment Calpol is a necessity... so this is always in our changing bag recently. 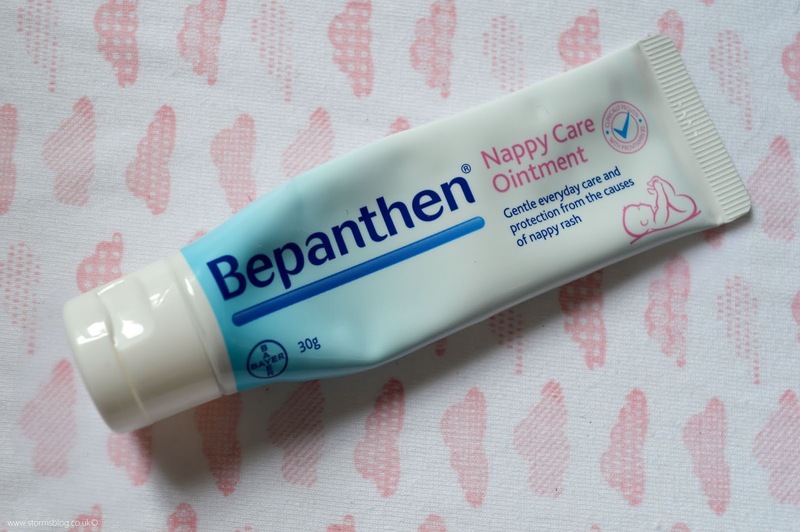 Once again Bepanthen is another item you will always find in our changing bag, babies skin is so sensitive I tend to pop this on Maci even if she isn't red it just protects her skin whilst she's wearing her nappy. 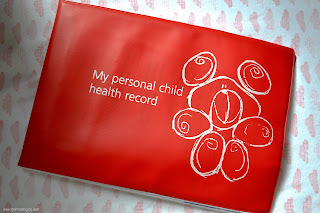 When your baby is born you are advised to always carry their red book in the changing bag incase of emergency... plus if its always in your changing bag you haven't got to worry about finding it when it comes to those horrible injections because you already know where it is! 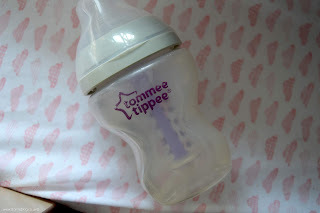 I haven't actually spoken about Maci's bottles on here yet so I thought this would be a good opportunity to. When Maci was a few weeks old we knew something wasn't quite right and we were told she has Colic and silent reflux meaning she has to have special 'anti-colic' bottles. At the time we decided to use the 'Tommee Tippee Anti-Colic' bottles but since then I have also tried the 'MAM' Anti-Colic bottles which also work very well. 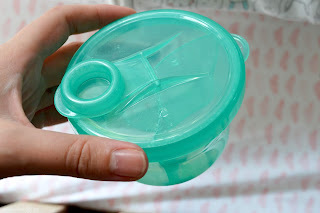 And finally, this is what I use to carry around the milk powder without it spilling everywhere. I picked this particular one up in Morrisons and it has three compartments inside which you measure out the exact amount of milk powder your baby drinks and then once they are hungry you simply open the little cap and tip it into the sterile water in the bottles... makes it a lot easier! 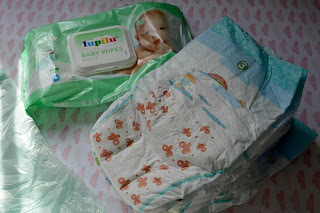 So that's what I have in my changing bag, its a lot isn't it!? If you're a parent, what do you have in your bag which I don't, let me know below.